Previzion is unique in the fact that it’s part of its solution to map parameters of a physical lens over the span of its zoom and focus range. 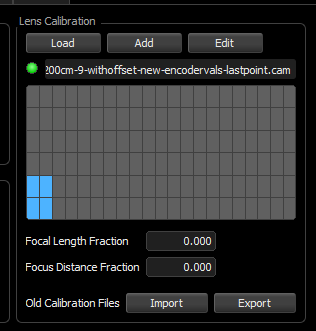 To load, edit and add lens calibrations. Editing lens calibration files is a feature that has been implemented as of build 7686. The method for calibrating lenses has also changed and it takes into account values at infinity distance. Lens calibration files are stored in an XML format and have a .cam extension. We recommend doing lens calibrations for each lens on a serial number basis. The interface has a gray grid that represents a matrix of the lens focal length and focus values. Starting from left to right, we go from min zoom (wide) to max zoom (telephoto) and from bottom to top, we go from min focus to infinity focus. Old calibration files are still able to be imported and exported. The lens system works by interpolating between valid lens calibration points. Lens calibration is covered in more detail in a separate chapter. The input from the lens controller comes into Previzion as a value from 0.000 to 1.000. This is called the Focal Length Fraction for the zoom axis and Focus Distance Fraction for the focus axis. For this to work, lenses have to have what is called “hard stops,” which means that the lens focus and zoom ring cannot be turned perpetually. The focus and zoom ring need to have a minimum and a maximum position. This is what we call the Lens Travel. Previzion does not currently listen to Iris input. For the full Lens Calibration procedure and recommendations, please see our Lens Calibration Chapter.